Our Saws are exceptionally accurate, beautiful, and perfectly set for the jobs for which they are designed. Saw blades are made from polished Swedish Steel and tempered to Rockwell 52 for durability and ease of sharpening. We take care to make sure our saw blades are properly sharpened and accurately set. Saw teeth have a minimum set that prevents binding while ensuring straight cuts. Solid, precision-milled Brass backs stiffen the blade and add weight for well-balanced, smooth cutting. 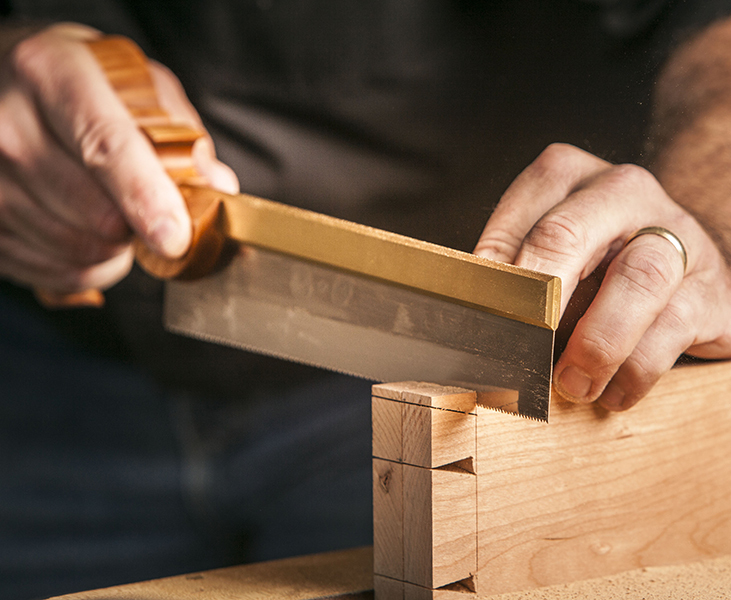 We carefully hand shape and finish each Curly Maple handle for a comfortable, silky-smooth grip. Each Lie-Nielsen Saw is precision hand-filed, set, and test cut in hardwood before it leaves our shop. Our saws will stay sharp for a long time, but eventually they will need to be resharpened. You can do it yourself or send it to us. Resharpening service is $25 including return shipping in the continental USA. For saw sharpening service in the UK, you may contact Skelton Saws: www.skeltonsaws.co.uk, or skeltonsaws@gmail.com.